The mountains south of Xizhi have a few steep valleys that make good waterfall territory. 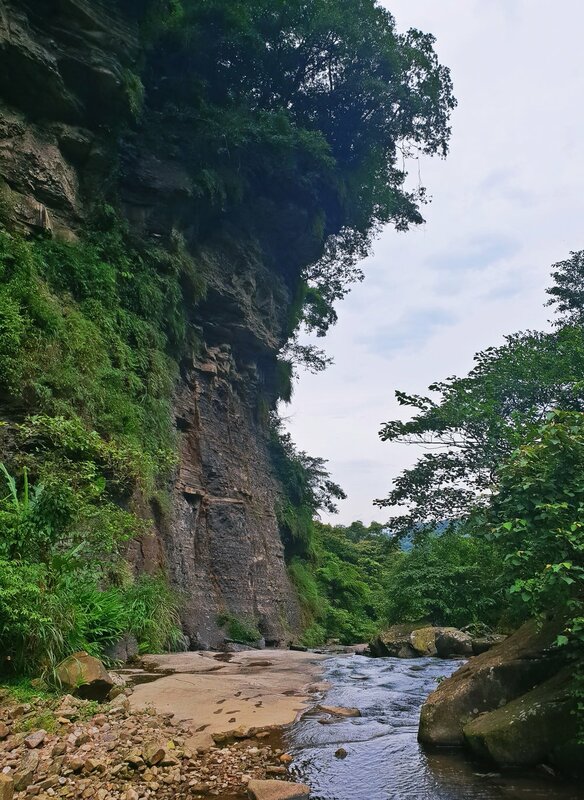 I've previously written a short post on some of the waterfalls on Dajianshan, and also visited the disappointing Tai-an Fall (no post but it's on here). A short but varied and fun river trace follows a small valley called Jiangziliao near these two sites. Public transport is not much use for this one. Just one infrequent minibus comes up here. Follow the directions to Jiangziliao Cliff on Google. Head up the trail and just above the waterfall climb onto the smooth riverbed. The cliff itself is imposing and overhangs precariously. Scattered large boulders on the riverbed suggest staying here for a long time is a bad idea. Just under the cliff is Jiangziliao Waterfall. There had not been much rain recently and the fall was covered in green slime. After a bit of rain it's probably a little more photogenic. The riverbed here is smooth and in places quite slippery. Don't attempt this without the felt-bottomed river tracing shoes. A helmet for some of the upriver parts is a good idea too. The geology of this river changes quite often. 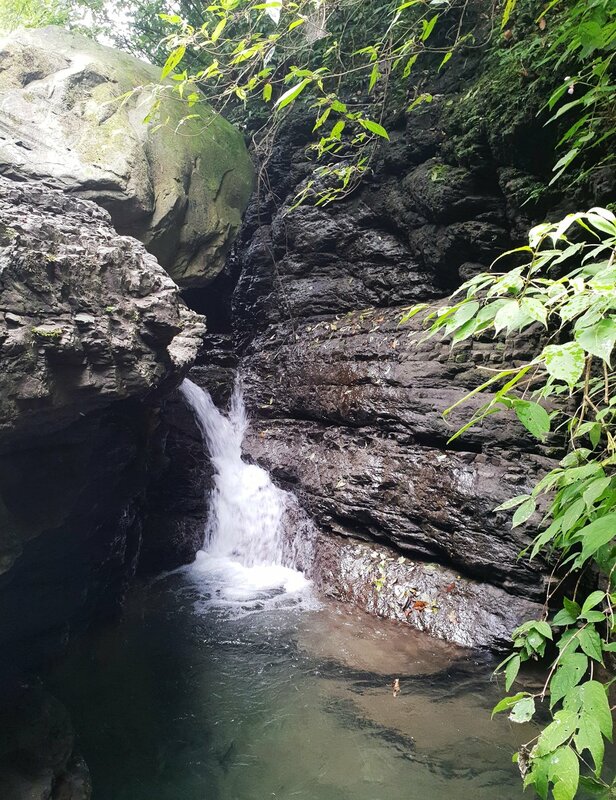 There are rough stretches of boulders interspersed with smooth shale banks and small waterfalls. It made it a lot more interesting than the usual piles of stones. In a few places it's best to take short tracks around the rockfalls in the stream. A short way upriver there's a larger pool and the river undulates over a steep bed of slate into the far end. This is slippery enough to make a fun little natural waterslide. Past a narrow pool we climbed up a waterfall in a dark hollow. Going up and down this looks harder than it is, though the water was low when I went. Above this fall it looks as though storms and landslides have taken their toll on the valley. The area is a mess of slippery rocks and not very attractive. We pressed on up the valley but to diminishing returns. On return we spotted this tiny whirlpool vortex and later a huge praying mantis jumped on my backpack for a short ride. I'm terrible at time estimates but I'd say this short trace only took an hour or two. It's a good introduction to river tracing and given the location away from convenient transport I doubt it ever gets very busy. Have a look on the Hidden Taiwan Map for more.